Scientists lost contact with Spirit as it prepared to drill a hole into a rock dubbed "Adirondack." 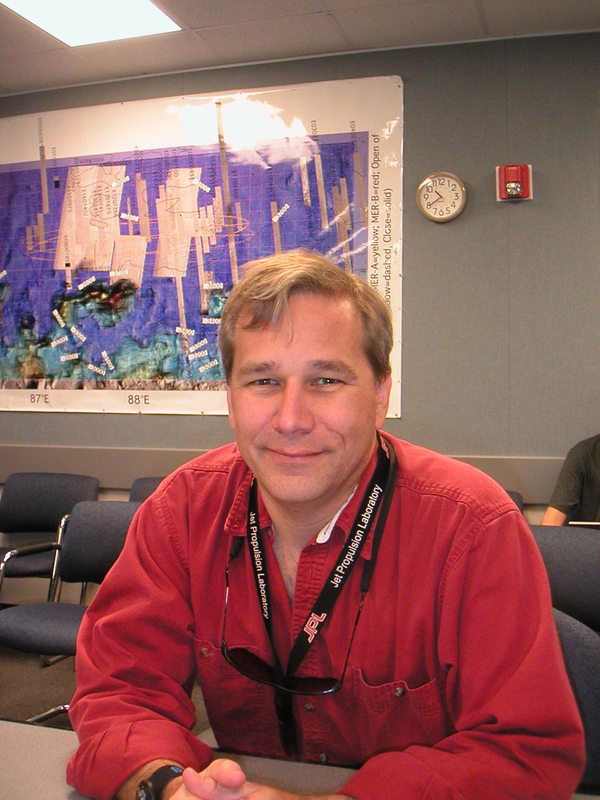 Mark Adler is a mission manager who lives in a spacecraft operations world of computer commands and logic. At times when he is speaking, it seems his mind is working so fast that his words can barely keep up. Thinking fast was essential when Adler's team rescued the rovers from death's door in a race against time to keep their batteries from failing. 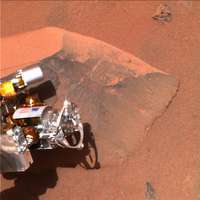 That was after Spirit was already on the surface of Mars. More than two weeks after landing, team members waited for news of the first hole to be drilled on Mars. 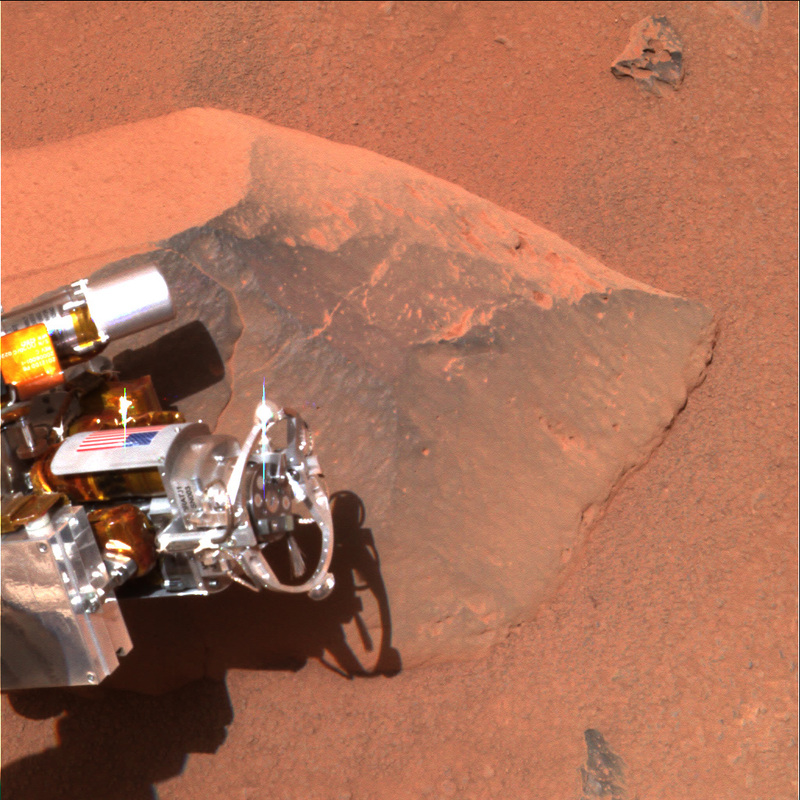 Spirit was to use its rock abrasion tool to grind a hole in a rock dubbed "Adirondack." 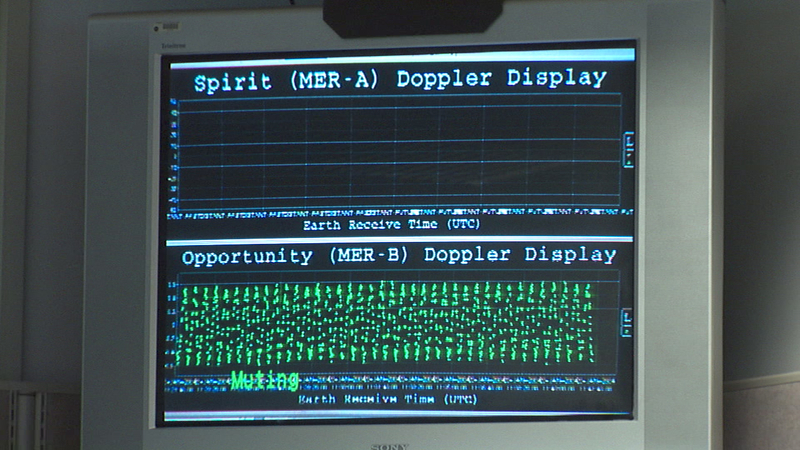 Spirit's communication window went dark 2 1/2 weeks after landing on Mars. Technicians at NASA's Deep Space Network antenna outside Canberra, Australia reported that they had received no confirmation from the rover that it had gotten instructions from Earth. Because rain was affecting communications, they didn't worry too much at first. The next day passed with no communication either. When a smaller antenna failed to make contact with NASA's Odyssey spacecraft orbiting Mars, the rover team became concerned. Communications specialist Serjik Zadourian checks with antenna stations around the world searching for a signal from Spirit. 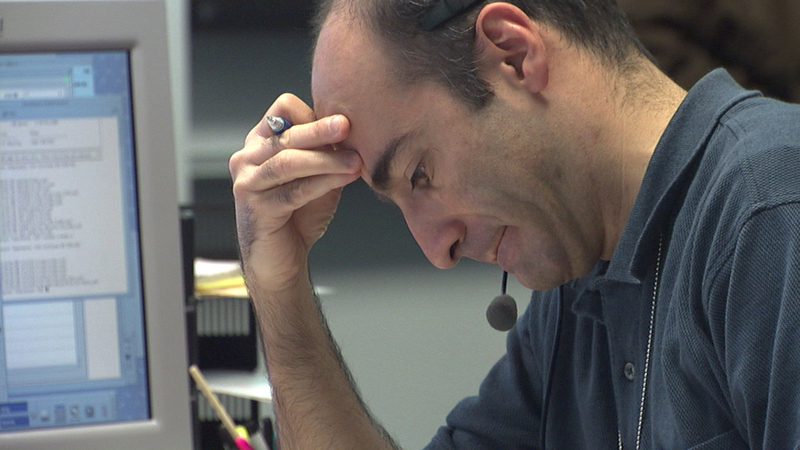 "This is the way it starts when you lose a spacecraft, you lose communication," said Adler. "So we were definitely in the ‘Pasadena, we have a problem' situation." The team told the rover to send a simple beep to Earth – a five-minute blast of radio communication to let them know it was alive and listening. No beep. Again. No beep. Mission controllers requested help from antenna stations around the world. No beep. Hours passed. Finally they decided to send a command at a different rate, similar to talking more slowly. This time, they got a response. They knew then the rover was potentially alive. Spirit was in trouble and engineers were in a race against time to save the rover. The team was working on Mars time, in a building at JPL isolated from the California time of day by blackout shades on the windows. It was nighttime for the Spirit rover and nighttime for Spirit's handlers. "Sleeping and eating were optional," said Adler. "There were cots we could sleep on in our offices. This was our one objective, our primary objective in our lives, was to get our spacecraft back." The next transmissions from Spirit were garbled. The rover was babbling, doing things like sending nonsensical communications that it date-stamped as being from the year 2038. Spirit, can you hear me? Scientists and engineers worked around the clock to try to restore Spirit to operational health 2 1/2 weeks after the rover landed on Mars. In the midst of the gibberish, the team got a 30-minute session of data that actually made sense. A key packet of engineering and health data told them the rover's temperature was way up and its battery power was way down. The rover's health was failing because it was constantly rebooting its computer. "So we knew then we were in a race," said Adler. "The battery was going down and it wasn't going to sleep the way it was supposed to. The rover had been up constantly, apparently doing resets. Somehow we had to get this rover to go to sleep and recharge its batteries." Mark Adler led the tactical team whose job it was to rescue Spirit. Spirit had a fever and it was dying. Like a child pretending to obey, the rover even went so far as to say "OK" when team members told it to go to sleep. By now, engineers were getting wary and radioed another message to Mars. Wide awake, the rover answered. The team figured Spirit had reset its systems more than 100 times trying to get itself back into shape. It was depleting its own battery trying to get well. The team finally decided to try a different approach. They put the rover in "crippled" mode, said Adler, which was actually far better than the condition it was in. They cut off the flash file memory, which turned out to be the site of the malfunction. When they finally got the rover to listen, the first thing they told it to do was go to sleep. 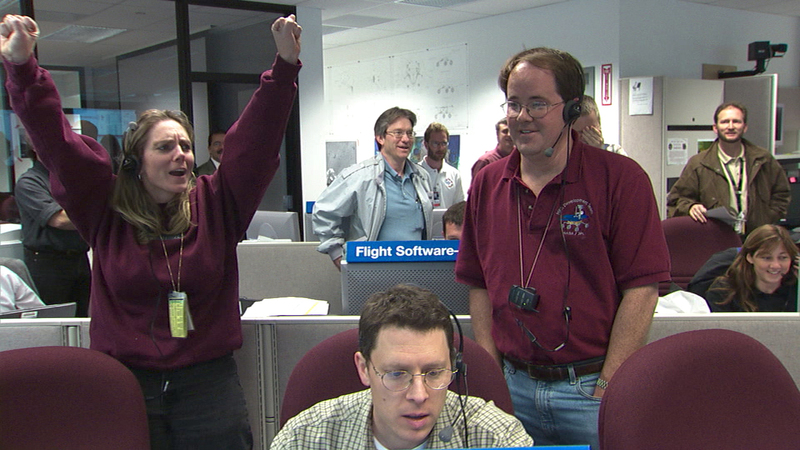 Spirit Mission Manager Jennifer Trosper and Deputy Project Manager Richard Cook rejoice as the team finally makes contact with the Spirit rover. 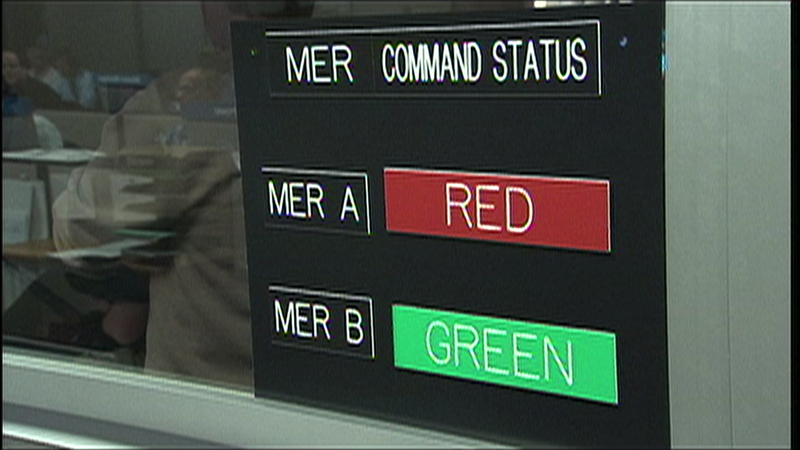 In the foreground, MER Flight Director Chris Salvo reads a computer screen. "So now we had won the race," Adler said. But their patient was far from well. Each morning the rover would wake up confused. Engineers spent four days tracing all of the tasks it performed, deleting its files, reformatting its computer hard drive, and watching its every move. In the end, they saved not only the Spirit rover, but the Opportunity rover as well, which was carrying all the same software and hardware as Spirit. While Spirit was in a fight for its life, its rover twin, Opportunity, had arrived on the other side of Mars.